6 Bedroom Detached House For Sale in Hemel Hempstead, Hertford for Guide Price £2,000,000. As one drives through the impressive porte cochère and sets eyes upon the attractive white brick and timber façade of Rent Street Barns, one is struck by an overwhelming sense of history. A sweeping circular driveway leads to the front door which only adds to the authenticity of the property since the door is made of heavy oak and believed to have been installed when the house was originally built. Another attractive yet quirky feature in the area at the front of the house is the purely decorative, red Royal Mail post box. The house stretches in two directions from the reception hall; left to the dual aspect drawing room, kitchen and utility beyond, and right towards the other principal ground floor rooms, all of which span the depth of the house and are dual aspect, affording attractive views across the gardens. The kitchen is also dual aspect and retains the original leaded windows. The sitting room, located between the reception hall and the family room, represents the heart of the house with a welcoming log fire during the winter months. A panelled door leads to the family room which has concealed cellar accessed via a staircase beneath a hidden trapdoor, and spectacular dining hall beyond. Again this room has magnificent leaded mullioned windows which incorporate a window seat. The floorboards are oak and there is a large, open log fire at the far end. One cannot help speculating about the magnificent soirées that would have been held in this dining hall during years gone by, overlooked by the minstrels’ gallery above. Today, the dining hall doubles up as a games room and has a relaxed seating area near the fireplace; the perfect spot for Christmas parties and entertaining on a grand scale. The only recent addition to the original house is the south-facing conservatory off the reception hall. This is triple aspect and often flooded with light on sunny days; it has a cheerful red tiled floor. The staircase rises to the first floor landing which leads to the six bedrooms. The master bedroom has an open fireplace and a Jack and Jill bathroom with access to the landing. One of the other bedrooms is dual aspect with views across the gardens and fruit trees; it also has an open fireplace. Bovingdon is a pretty village with a fine range of amenities to include shops, a library, churches, restaurants, pubs, a nursery, a doctor’s and a dentist’s surgery as well as infant and junior schools. For more comprehensive shopping requirements, the towns of Berkhamsted, Hemel Hempstead and Watford are nearby. The main line to London/Euston is approximately 36 minutes (fast train from Hemel Hempstead station). The A41 connects to the M25 providing access to the national motorway network and airports. Locally there is an abundance of sporting activities available with several golf courses and scope for walking and riding. Champneys health resort in Tring and the exclusive Grove Country Club in Watford are close to hand and offer exercise facilities, relaxation and spa therapies. The area is well served for private and state schools, including Berkhamsted and Watford Grammar schools. Rent Street Barns is set back from the road by the barns and gravel forecourt to the front and there are gardens and orchard land to the rear. In turn, the rear gardens lead to the tennis court. In a good year, the mature fruit trees bear plentiful crops of apples, pears and plums. 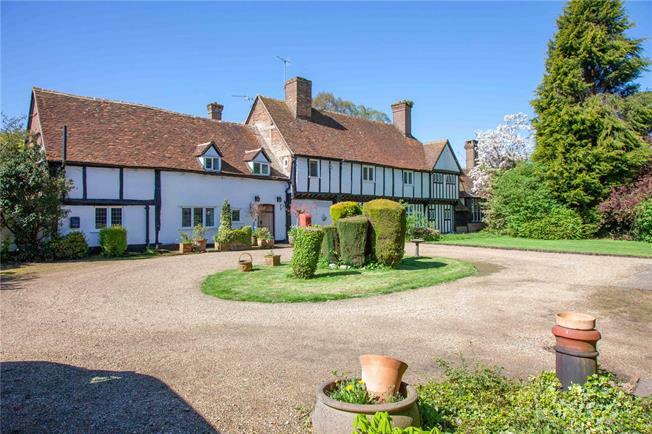 Part of the charm of this unusual property lies in the outbuildings lying to two sides of the forecourt. Formerly they served as barns and stabling whereas today, the current owners use most of the space as garaging for numerous cars. The annexe adjoins the barns and provides self-contained accommodation comprising two bedrooms, a sitting room, kitchen and bathroom. Local Authority: Dacorum Borough Council.